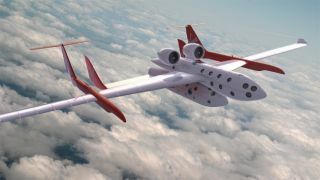 Artist's illustration of Virgin Galactic's SpaceShipTwo and drop-ship in flight. ASPEN, Colorado ? Public space travel is a going and growing industry, but with a number of hurdles to overcome before becoming a sustainable and profitable marketplace. There is already over $1.5 billion invested in new air transportation ventures and an estimated $1 billion in new commercial space ventures. But in the blossoming tourist-class, passenger spaceflyer market, much needs to happen: from harnessing the technology and dealing with regulations to financing and satisfying customer needs and desires. Public space travel experts gathered here at Flight School 2007 ? Flying: Beyond A to B, a workshop for commercial space and private aviation ventures, held June 20-22 at the Aspen Institute. The unique gathering was hosted by computer and entrepreneurial investment imaginer, Esther Dyson. ?On the one hand,? Dyson told the Flight School audience, ?there is the optimization of air travel. Then there?s private space travel on the other. You have many, many problems in common starting with financing, finding customers, running your businesses, marketing?defining what your business is,? she said. That being the case, while public air transportation and space travel businesses cater to different customers, there?s room to learn from one another, Dyson said. Moreover, there are opportunities to overcome the obstacles, she added. ?Ironically, it is precisely because space travel is defined as not transportation that it can escape the heavy regulation that governs air transportation?and that it can be tried at all, and be practiced enough to become safe enough,? Dyson told SPACE.com. ?In other words, if it [space travel] were defined as useful, it would have to be much safer. But the only way it can get safer is through trial and error. In fact, we need a little more trial and error in aviation, not on the safety side, but on the business model side,? Dyson emphasized. There is a need to go beyond sitting around crunching numbers and carrying out viewgraph rocket engineering. To get safe, you?ve got to fly, said Jeff Greason, President and Chief Executive Officer of XCOR Aerospace in Mojave, California. ?You have to find out what the problems are. And you have to fix them to drive them out of the system,? Greason said. ?XCOR people turn wrenches and make rocket engines. That?s almost a deliberate choice on our part. We don?t want to take the specialness of the space experience away. But if it doesn?t get to be more routine, more common, and more accessible, then there?s no business there.? The space travel business model is evolving, observed Rich Pournelle, XCOR?s director of business development. ?As an industry, we?re very much in a transitionary period in that some people have flown demonstration vehicles and shown that this kind of stuff can be done. But not a single one has flown a revenue flight, in terms of transporting people into space.? For the last 40 to 50 years, there?s been a dumbing down of the aviation enterprise, suggested Peter Diamandis, Chairman and co-founder of the X Prize Foundation. It has moved methodically onward over those decades. What is happening now, Diamandis said, is that there?s been a vacuum created where regulation has been reduced, or where new technology has come in. Furthermore, there?s a third dimension in that dotcom capitalists have come in and are willing to take risks. ?The Very Light Jet market and the private aviation market are being born almost at the exact same time?and for many of the same reasons as the personal spaceflight industry,? Diamandis said. ?People want the chance to personalize aviation and personalize space. There are people demanding it.? ?Funding is a critical issue,? said Kevin Leclaire, Managing Director of ISDR Consulting of Reston, Virginia. Venture capitalists (VCs) raise their own funds based on an investment focus that they have. If they have a communications focus, they could invest in satellite communications ventures - and have, he said. However, Leclaire said that certain space businesses such as space travel, are almost always outside the scope of VC investment focal points. ?A VC firm will get penalized if they invest in a business outside their focus if it doesn?t perform well. Even if the investment does well, the VC?s limited partners will usually not give the VC credit for the success because it happened outside of the VC?s investment focus - a lose-lose scenario.? And that leaves a few VCs whose investment focus includes travel or space-related investments, or possibly those with regional or even ?opportunistic? categories for investments that they consider, Leclaire explained in a post Flight School email to SPACE.com. ?Thus, instead of VCs, angel investors tend to be the primary recourse for early space travel companies.? Leclaire said that space businesses that are not already well-funded and are approaching new markets -- like public space travel -- need to gradually expand their ?business envelope? in much the same way as one might expand their test envelopes for a new aircraft or spacecraft. ?Most investors like to invest in proven markets. Suborbital space travel is a new, unproven market, so companies in the sector have to rely on the best surrogates for market data in the absence of actual revenues,? Leclaire said. ?The best of these market indicators are the deposits that have been taken by some of the prospective suborbital operators." Additionally, Leclaire pointed out, there is market data on the paying passengers sent to the International Space Station by Space Adventures, as well as the Zero-G flights and high altitude fighter jet flights sold/operated by companies such as Zero-G, Incredible Adventures, as well as Space Adventures. ?Ultimately though, at the end of the day, the only way to make the suborbital travel market ?real? is to have an operator begin to start sending paying passengers up, bring them back safely, and book the revenues,? Leclaire concluded. Keeping the customer satisfied -- not only in terms of space travel safety -- but also making the spaceflight experience enjoyable is a high priority. ?People that I?ve come across that want to consider spending a big part of their net worth to go to orbit?they want to know that they are coming back,? said Eric Anderson, President and Chief Executive Officer of Space Adventures, headquartered in Vienna, Virginia. That firm has handled five private space trips to the International Space Station, with each client shelling out in the range of $20 million to $25 million for their flight. ?Whether or not the windows are 18-inches or 20-inches across is of secondary importance to being secure in the system,? Anderson said. ?Safety first and, of course, great customer service,? he added. Paying attention to those ?little details? is part of good customer relations, said Jane Reifert, President of Incredible Adventures, based in Sarasota, Florida. While spotlighting the risk associated with adventure tourism, she added that operators can?t forget that they are in the business of making dreams come true ? ?and that?s a huge responsibility.? Waiting for the ?Netscape moment? Work is underway in building the SpaceShipTwo ? a passenger-carrying vehicle now under construction at Scaled Composites in Mojave, California. ?Safety is our number one priority,? said Alex Tai, Chief Operating Officer for the Sir Richard Branson-bankrolled Virgin Galactic, the spaceline operator that will utilize a SpaceShipTwo fleet to boost paying tourists on suborbital flings in the near future ? initially at $200,000 a seat. ?We?re not here to do this for free, but we are here to react to our customers,? he said. Tai said he?s looking for that ?Netscape moment? when the public space travel business rockets to stardom ? just like the internet browser did when it kicked-started the dotcom boom of the mid-1990s. ?We have taken in $25 million from an interest of 80,000 people?with our tiny sales force,? Tai told SPACE.com. ?There?s a huge appetite for this offering once we get out there?once we prove that it?s something that?s going to be safe, really fun to do, and is repeatable. What will happen then is that, suddenly, everyone will see Virgin Galactic making an awful lot of money. And that is the next ?go? moment.? Tai speculated that when Richard Branson decides to fund his next big venture, and he sells 10 percent of Virgin Galactic for $100 million, people will hunger to be part of the public space travel business. ?But at the moment, these guys don?t want to invest because there hasn?t been that Netscape moment,? Tai continued. ?It is being held up because Virgin Galactic is the gorilla in the room. Who is going to take Virgin on? That?s a shame because I believe it?s a massive market. I would much rather there?s competition getting ready now,? Tai concluded. Space Tourism: A Multimedia Adventure!